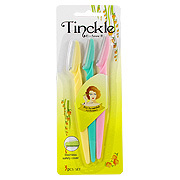 Tinckle Eyebrow Razor removes the fine hairs of the eyebrow, neck and face as well as unnecessary hairs elsewhere. 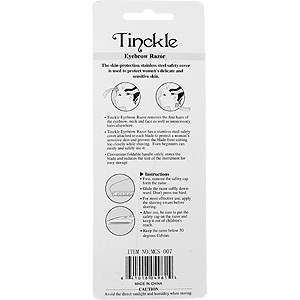 Tinckle Eyebrown Razor has a stainless steel safety cover attached to each blace to protect a woman's sensitive skin and prevent the blade from cutting too closely while shaving. Even beginners can easily and safely use it. 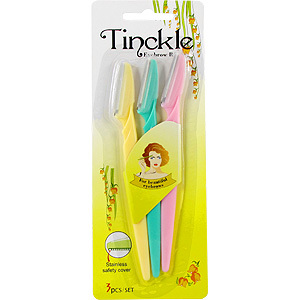 Convenient foldable handle safety stores the blade and reduces the size of the instrument for easy storage. Caution: Avoid the direct sunlight and humidity when storing. Eyebrow Razor is shipped in a discrete, unmarked package. Orders are processed immediately and usually take about 3 to 5 working days to be received. We do ask that you try it for 2 to 3 weeks to feel the full effects. Any information received is used only for order processing and shipping purposes. Your information, such as e-mail address, will never be disclosed to a third party.